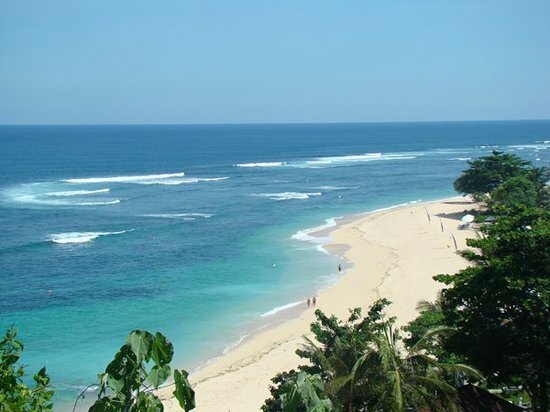 Geger Beach is located from the highway heading to Nusa Dua, Geger beach is a beautiful white sand beach glistening in the sun. The sea is calmer here in comparison to Kuta or Balangan beach, though sometimes it may get a bit rough by the evening so please beware. Local seaweed farmers do their work here sometimes so if you are lucky you can enjoy watching them going about their livelihood. There are many cafes dotted along this beach making it famous for Sunday brunch or just for drinks and there is a temple at the end. 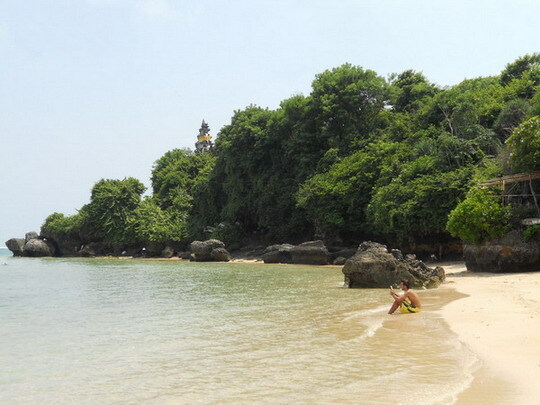 Welcome to Geger Beach, Bali! There are a lot of activities you can do in Geger Beach. Apart from water activities, such as swimming, diving or surfing, you can simply just sit and enjoy the beautiful panorama of the beach. However, for you who love sports, you can use the facilities offered by the beach and the resorts around the beach. One of the sports loved by most visitors of the beach is golf. Visitors can play golf in the resort near the beach. You can play golf while enjoying the stunning panorama around the beach. Playing golf will surely relieve your tension after having worked hard during the day. There are many hotels and resorts near the beach you can select. Apart from luxury price hotels, there are still some hotels and lodges within your budget range. For travellers with tight budget, you can select Rasa Sayang Beach Inn which lies in Tanjung Benoa. The price for staying there per night is about Rp200,000 (US$21.00). While for those who have a little more budget, you can select a mid-range hotel, such as Bali Tropic Resort and Spa for about Rp950,000 (US$99.00) per night. Lastly, for splurge budget, you can select Aman Nusa for Rp7,200,000 (US$750.00) per night.